A headstone will memorialize a loved one for many years to come. The design should not only mirror the deceased’s personal tastes, but should represent the way in which they lived their life. When the time comes to decide you’ll be faced with many questions – “Where do I start?,” “What type of headstones are permitted?” etc. – and making a choice during this difficult period can be highly stressful. The purpose of this guide is to help you make a more informed decision without letting your emotions cloud your judgement. When choosing a headstone you must first decide what text and images to use. Each letter counts and can significantly affect the outcome of the design. Choosing afterwards will only leave you with limited options. The upright headstone is the most traditional design. They are usually made from granite, marble or limestone and are fixed to the ground with a concrete base. They are typically 45 inches tall, 30 inches wide and 6 inches deep. Image caption: A typical upright headstone. Image courtesy of Memorials of Distinction. Flat headstones (flat tablets, flat markers) are usually made from granite or bronze. They can either be flush with the ground or raised to a slant from the rear (raised-top flat markers, bevel markers). Like traditional headstones they are available in a variety of colours, finishes, sizes and materials. Image Caption: A typical flat marker. Kerbed headstones (ledger markers) are full length headstones that lie flat at ground level. They are a minimum of 4 inches thick and provide more room for personalized expression. Ledger markers can be combined with slant and bevel markers in addition to traditional upright headstones. Image caption: A typical kerbed headstone. Cremation memorials are similar to upright headstones, but will have containers (usually hollowed granite) for cremated remains on either side. These cremation containers are usually separate to the headstone itself. Benches can be used in place of a headstone and do not require a concrete base. Some styles will hold the remains of up to six people. Cremation benches are often used to enhance the look of memorial gardens. The material of the headstone is a very important element to consider as it can affect your placement options and the visual properties of the design. In addition, the durability of the stone or metal can significantly impact the longevity. Granite is without a doubt the most adaptable material. It’s available in a variety of colours and finishes and is the most durable stone of all. Due to its wide availability it’s also the cheapest. Many churchyards will only permit granite headstones as they prefer to retain the traditional aesthetic properties of the premises. 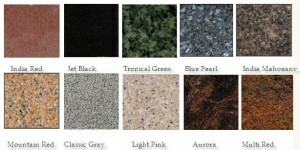 Image caption: Granite headstone colour options. Image courtesy of Riverside Memorials. White marble is a bright material that contains unique blue and grey textures that look like veins. It’s always given a finely rubbed finish to make it look and feel smooth. White marble is not permitted in churchyards and, due to the fragility of the stone, should not be placed in damp areas. Nabresina is a type of limestone that has a beige hue. Like white marble, it is finely rubbed to a smooth finish. Limestone headstones aren’t as durable as granite or white marble, but are usually permitted in churchyards. Portland is a type of grey limestone that will harden and discolour over time, which gives it a worn and weathered appearance. Due to the colouring one relies on shadows to read inscriptions; therefore, deep cuts and capital letters are required. Portland is a ‘classic’ headstone material that is often used in churchyards. Bronze headstones are becoming increasingly popular due to their resilience. Bronze will naturally darken over time; however, it requires very little maintenance. It’s not permitted in churchyards and is generally more expensive than granite. Choosing the finish is just as important as choosing the material and will have a significant impact on the durability and appearance of the headstone. Like the material, if you want to bury your loved one in a churchyard you have limited options. Polished headstones are smooth and shiny. The majority of churchyards won’t allow them because they have a reflective surface which can look out-of-place among older stones. Regardless of the material polished headstones will require regular cleaning and maintenance. Part-polished headstones are only polished or honed on the inscription and base area. Everywhere else is either sawn, sanded, blasted or rubbed. This effect is used to emphasize the epitaph and images. Honed finishes (eggshell) are smooth, yet unreflective – an effect that’s achieved by partially removing the polish with dust. They are often used with headstones that have three or more colours in order to give them more depth. Honed finishes are usually permitted in churchyards. Pitched (rock pitch) finishes are created with a bolster and hammer. Pitched headstones are very rustic and often used in older churchyards. There are also other finishes, such as steeled (frosted), sawed and axed; however, they are less common. These alternative finishes are achieved by using different chisels, flaming and sandblasting techniques. Bases can be finished differently to the headstone itself. People often choose to use a polished base for the names, dates and epitaph in order to keep the tablet simpler. Flush, bevel and slant markers can have the same finishes as upright headstones. 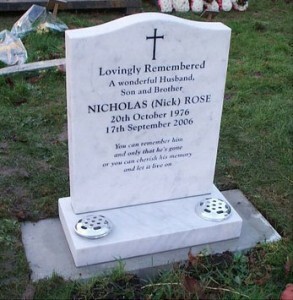 Only after you’ve finalised your epitaph and chosen what images to use should you select your headstone design. 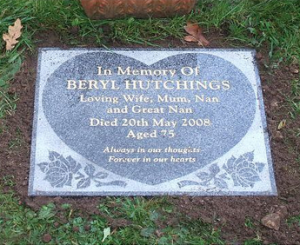 While dealers will have a selection of shapes and sizes, all headstones can be personalized to suit your needs. There are various ways to include images on headstones. Nowadays stonemasons are able to etch designs using laser technology; however, some will still provide traditional hand-carved services as well. Images can also be attached using ceramics. This is recommended if you’d like a full colour photograph. Like the epitaph the image should represent the deceased’s beliefs, lifestyle and personality. For example, if they were religious, then some kind of symbolism may be appropriate, such as a cross. The font of the inscription will impact the entire design. Traditionally either a roman, old english or a script-like font is used. Before you decide what lettering you want, speak to your stonemason and ask them if they have any recommendations. Some fonts require a deeper cut than others and may not be clear when inscribed into certain materials. Italics are usually reserved for bible passages, quotes and poetry, while bolder text (usually capitalized) is used for names and dates. Image caption: Commonly used headstone lettering. Image courtesy of Lanark Memorials. If you have a specific churchyard or cemetery in mind make sure you check their rules and regulations regarding materials before you choose your stone. While most council-run cemeteries will allow almost any type of headstone, it’s always best to check. Churchyards can be fairly restrictive and rarely allow polished materials. In most circumstances they will prefer grey granite or a stone with similar visual properties. In addition to finding out what materials are permitted it can be a good idea to check the burial plot as the surrounding area will also affect the visual appearance of the headstone. In addition, it should blend in with the surroundings and compliment the churchyard or cemetery. Headstones are available in virtually any colour, but the most common are grey, black, white, red and blue. Cemeteries generally don’t have any specific colour guidelines; however, they may wish to assign a burial plot based on what colour and finish you choose. Churchyards usually have specific material, finish and colour guidelines that are decided by the local parish. 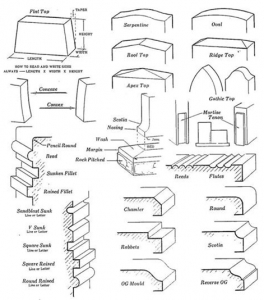 The contours and mouldings (cut or carve) summarizes the general shape of the headstone head and base, and could influence other design elements such as the lettering and finish. A good stonemason will be able to create custom contours and mouldings if you can’t find a suitable shape. Image caption: Commonly used contours and mouldings. Image courtesy of Patten Monument. Every churchyard and cemetery will have its own dimension requirements. If in doubt consult the local parish or council. Your stonemason will help you adapt your design if it doesn’t meet the specifications. Image caption: The typical dimensions of an upright headstone. Image courtesy of Millennium Headstones. Children’s headstones usually feature playful imagery such as footballs, teddy bears and musical notes. They are usually available in upright, flat and kerbed form and can be made from the same materials; however, there may be restrictions for churchyard burials. Headstones for military veterans who have died during active duty are available at no cost. Most military headstones are made from granite, marble or bronze; however, if they are buried in a specific military cemetery there may be restrictions in order to retain a sense of continuity. Unlike civilian headstones a military headstone will also contain information regarding their branch of service. If buried in a military cemetery the headstone will be maintained by on-site staff at no extra cost. The inscription is the most important part of the headstone, yet it’s arguably the most difficult part to finalize. Finding the right message to represent your loved one is challenging as it should be short, dignified and summarize their life. There are three common ways of showcasing this message; through engravings that are directly carved into the stone; through memorial plaques that are attached to the stone; and through metal or ceramic letters that are attached to the stone. Engraving the inscription directly into the stone is the most common way of presenting a message. The depth of the engraving can highly affect its visibility and should be determined by the headstone colour and the font of the lettering. Sometimes it’s better to paint the carvings with enamel to give them more prominence; however, the paint will inevitably fade and have to be reapplied in time. Engraving directly into the headstone is usually charged on a per-letter or per-word basis; however, most stonemasons will supply a certain amount of characters for free. Memorial plaques are usually used for longer messages that either don’t fit on the headstone or would be too expensive to engrave. They are made from zinc or bronze and will require regular cleaning to prevent oxidization. The epitaph is the part of the headstone that people will remember. Most epitaphs will only be a few sentences long, but will summarize the deceased’s personality and the way they lived their life. People often use passages from the bible, verses of poetry or memorable quotes – basically anything that represents the deceased in a personal and meaningful manner. • Gone, but not forgotten. • Always in our hearts. • Though I walk through the valley of the shadow of death, I will fear no evil. • He shall receive in the world to come eternal life. • Blessed are the pure in heart, for they shall see God. • Thy remembrance shall endure into all generations. • God is love; and he that dwelleth in love dwelleth in God, and God in him. There are various legal regulations surrounding both cemetery and churchyard burials. In addition, each parish or council may have their own rules and requirements that must be met before the funeral takes place. Permission must be obtained by the local vicar in order to bury a body in a churchyard. To receive permission they must submit a CR1 Application to the parish. To bury a body in a cemetery you will have to follow similar procedures, but submit the form to the local council instead. If you are arranging a funeral through a memorial service they will usually submit all of the relevant paperwork on your behalf. Because cemeteries are owned by local councils and are not religion specific they will usually have very relaxed rules and regulations. However, there may be specific buildings or areas that are dedicated to certain faiths. • Inscriptions must reference Christianity. • The material and finishes must be non-reflective. 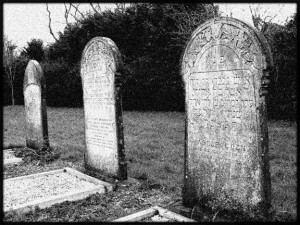 • The headstone must not contain ceramics or bold colouring. While the rules and regulations may seem strict, they are rarely definitive and you are allowed to apply for special permission if you would prefer something a little less traditional. However, if you manage to acquire permission the local parish will usually give themselves leeway to remove the headstone in the future without your consent. It’s difficult to place an exact figure on the cost of a headstone as they will significantly vary according to the size, material, finish and lettering, etc. In addition, the delivery charges can be very high. Not only will most memorial services only deliver within a certain radius, but some colours of granite are only available in certain quarries and may have to be shipped from overseas. Stonemasons may only provide a certain amount of engraved characters for free, and then charge on a ‘cost per letter’ basis if you need more. Fundamentally, the more bespoke the design the more expensive it will be. Because you can’t install a headstone until six months after the burial you’ll have quite a bit of time to acquire the funds or retrieve them from the deceased’s estate; however, bear in mind that most stonemasons will need around ten to fourteen weeks to cut, engrave and deliver the headstone. It’s generally recommended that you order the headstone when permission has been granted by the burial authority to ensure it is ready when the ground has settled. Most stonemasons will require a 60% deposit in advance – which can be retrieved from the deceased’s estate – and the remaining balance 1-2 weeks prior to the installation. Burial ground fees will heavily vary depending on the parish, council and faith. Some local parishes will completely waiver the fee altogether if the deceased was a regular churchgoer and active member of the community. On average, however, expect to pay at least £100 to £1,000. This will cover the excavation, matting, legal administration and staff attendance. Headstones are erected a minimum of six months after the burial in order to give the ground time to settle; however, this can vary in certain circumstances. For example, if the burial spot is on a hillside or uneven ground, waiting times can be as long as twelve months. Fundamentally, the stonemason will know best, so listen to their advice and you shouldn’t encounter any issues. In the event of a cremation, no waiting time is required and any headstone can be fixed as soon as permission is granted. Headstones should be installed by members of a licensed organisation; either the National Association of Memorial Masons (NAMM) or the British Register of Accredited Memorial Masons (BRAMM). Each organisation has their own stringent written and practical test procedures to ensure that their masons will provide a high standard of headstone construction and installation. Cemeteries and churchyards that are members of these governing bodies are not allowed to employ unaccredited headstone fixers. Headstones will naturally lose their colour and deteriorate overtime due to weathering; however, there are various preservation and cleaning techniques that can significantly increase their lifespan. Consolidator is a chemical compound that can re-bond the internal structure of stone. It acts by filling empty voids that could fill with water and expand, which can cause cracking and flaking. Most people make the mistake of using sealer without consolidator; however, this can be detrimental to the quality of the stone. When sealer is applied the consolidator won’t be able to enter the stone, which prevents it from filling in the empty voids. Consolidator, however, is only useful on sandstone, marble and limestone headstones and should be applied prior to installation. When people clean headstones they will often apply sealant afterwards when they appear to be dry; however, this is not recommended. While sealant will keep out moisture, it will also trap moisture, which can have adverse effects. It’s important to understand what cleaning products are safe to use before you start as conventional household cleaners can cause far more harm than good. In addition, if the stone isn’t firmly fixed into the base or is flaking on the surface you’ll probably damage them beyond repair. If you are cleaning a limestone or sandstone headstone always check the surface in advance for flaking, crumbling or potential problem areas. If any part of the headstone looks fragile, just remain cautious about applying excessive levels of cleaning solution. To clean limestone and sandstone fill up a bucket with distilled water and add a small cup of non-ionic water. Mix in the solution with a natural bristled paintbrush and gently wipe it over the surface. When cleaning limestone and sandstone never use metallic brushes, acidic cleaners or pressure washers. Marble is firmer than limestone and sandstone, but not as durable as granite. Although it can withstand more vigorous cleaning, it’s still best to avoid pressure washers. To clean a marble headstone combine a cup of ammonium hydroxide with a bucket of distilled water and apply it to the surface with a natural bristled brush. When you have removed the mould and mildew, rinse the entire stone with distilled water to remove the excess cleaning solution. Granite is the hardest headstone material of all and can withstand vigorous cleaning. One of the biggest problems, however, is that it often builds up large amounts of calcium deposits, which can significantly decrease the lifespan and cause the stone to lose colour. To clean granite headstones mix together a cup of non-ionic soap and a bucket of distilled water. Scrub the surface with a non-metallic brush or scouring pad, and then rinse off the cleaning solution. Feel free to use a pressure washer; however, beware of painted lettering as they will strip away the surface. 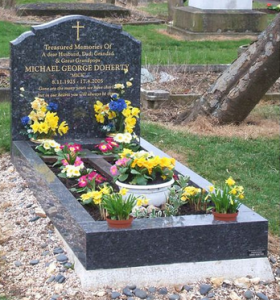 Bronze headstones and plaques will naturally discolour overtime, which will make the lettering more difficult to read; however, most people see this as part of the appeal. If you want to keep the bronze shiny for as long as possible you will need to clean, polish and wax it at least once per year. Start by making a cleaning solution with one-part water and three-parts non ionic soap. Apply the solution to a flannel cloth and wipe the surface, making sure you scrub away any dirt, mould or mildew. Rinse off the cleaning solution with distilled water and wait for the headstone to dry. Apply bronze wax with a clean flannel cloth and buff the bronze to a shine. 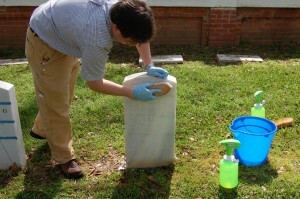 Image caption: Cleaning a headstone with a natural bristled brush. Image courtesy of the National Center for Preservation Technology and Training. If you don’t want to make your own cleaning solution there are specialist sprays available that are specifically designed for headstones. A typical headstone cleaner will remove mould, algae and moss. Most half-litre containers will have enough solution to clean at least three square metres. Although specialist products are relatively cheap, they are generally unnecessary and only recommended for exceedingly difficult stains. 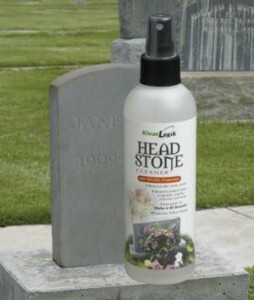 Image caption: Head Stone is one of the most popular headstone cleaning products available. Image courtesy of Make Life Easier. Greenhouse headstone cleaning is a concept that revolves around using slugs and snails to do the work for you. Slugs and snails love to consume lichens, mould and algae and will naturally flock to areas that are humid. By placing a plastic tarpaulin over a headstone you can create a greenhouse effect that attracts them; however, this method will only work effectively in hot weather. Before trying this technique cover any bronze or ceramic memorial plaques beforehand. This method may not completely solve the problem; however, it could get off that tough first layer and make the job a lot easier. Before you clean a headstone you should contact your local parish or council. Some cemeteries and churchyards won’t permit self cleaning and will hire a caretaker to perform the task on your behalf. In addition, deep stains should be left alone, otherwise you could remove the surface layer. In these circumstances you may need to hire a professional stonemason to refinish the headstone. Q: Where can I find the rules and regulations for my local churchyard or cemetery? A: Check your local parish or council’s website or call them directly and ask for more information. If you’re using a memorial service they will conduct the administration procedures for you so you won’t have to worry about the legalities. Q: Where can I buy a headstone? A: Almost every memorial service will have a showroom, website and brochure where you can purchase headstones. If you want a bespoke design call them directly or arrange a meeting to discuss the logistics. Q: What if I can’t afford a headstone? A: Headstone costs can be reclaimed or taken directly out of the deceased’s estate. If there is not enough money to cover the fees your local council may provide a simple headstone free of charge providing it’s claimed within a certain time period after the death (usually 3-6 months) and by a close relative. Q: What is the lifespan of a headstone? A: The lifespan of a headstone will vary depending on the material, finish, location and how well it’s maintained. Speak to your stonemason for more information. Q: Do we have to choose a headstone straightaway? A: You are under no obligation to purchase a headstone straightaway. Some people wait years to find the perfect design and epitaph. That said, most people prefer to choose the headstone while making funeral arrangements as it can provide a sense of closure. Installing a headstone hasn’t always been a part of the grievance process. Before the 1600s they were primarily used to mark burial plots near homes. It wasn’t until the mid 1600s that they became common in churchyards. Originally headstones were reserved for the middle and upper classes; but when Protestant theology became widespread, they became a staple aspect of the churchyard. Until the 1900s headstones were made from slate or sandstone, but when local councils started opening cemeteries the designs, finishes, materials and styles started getting more creative and becoming ways to actually ‘memorialize’ the dead.